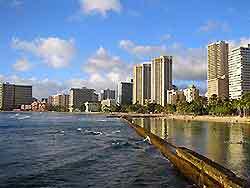 Located roughly in the center of the Hawaiian Island chain, Honolulu, capital of Oahu, is best known for Waikiki Beach, the undisputed king of beaches, which oozes charm, sophistication, hotels, restaurants and plenty of bronzed bodies. 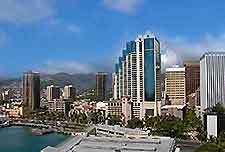 Honolulu definitely succeeds as one of the world's most fanciable destinations with its year-round bustling atmosphere and myriad of quality attractions for the whole family. 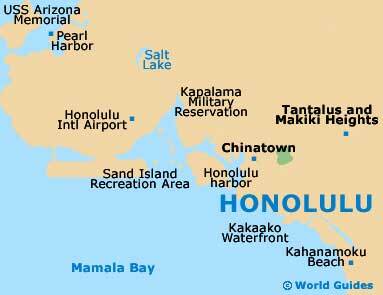 Before traveling to Honolulu check the Internet for useful information on things to see and do in Honolulu and take advantage of the many websites that offer full travel guides and travel tips free of charge. Maps and travel guides are readily available in Honolulu at visitor centers and travel agencies, while one of the easiest sources of visitor information for sightseeing in Honolulu will be your hotel reception, where you can get advice on opening and closing times and transport arrangements. While the Hawaiian language is still widely spoken by the native Hawaiians, as with other states in the US, the most commonly spoken language is English. For details on whether you will require a visa for travel to Hawaii, it is best to check with your nearest consulate or embassy for information specific to your country. There are a number of different types of visa available, with tourists normally being required to obtain a non-immigrant visa that permits temporary stay. Citizens from Visa Waiver Program countries are allowed to enter Hawaii without a visa if they can meet certain requirements. If you are applying for a visa before your arrival in Honolulu, it is advisable to apply well in advance as there can be delays in processing applications. There are several categories of non-immigrant visas available to those wishing to work in Hawaii and the US temporarily. 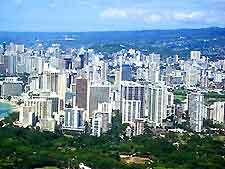 Working in Honolulu without a visa is strictly forbidden and there are harsh penalties for those who are caught in breach of this law. Persons wishing to work in Hawaii must apply for the relevant visa in their home country and usually require a letter from their prospective employer. Tipping is common in Hawaii, although it is only required should you consider service to have been satisfactory. When dining out in Honolulu's many restaurants, a 15 percent tip is generally expected, although it's worth taking note of whether there is a service charge already included in your bill. Not so long ago Americans accepted smoking in public places without much fuss, but nowadays things have changed dramatically in Hawaii. Smoking is restricted in many public places throughout Honolulu, including most restaurants and modes of public transport. If you are a smoker in Honolulu, it is always a good idea to check with those nearby smoking is permitted before actually starting to smoke.